All in all, it’s a good ride. Fuel cell cars have been auto engineers’ playthings since the mid-1960s, when 250 General Motors workers spent two years building a single, drivable hydrogen-fueled van. Toyota, GM, Daimler and Mercedes all have hydrogen fuel-cell cars racing toward commercialization later this decade. Without the blue-on-white decals that brag “Zero CO2/KM,” passersby would be forgiven for thinking Hyundai’s vehicle was, in fact, a regular Tucson. The magic occurs on the inside. Ambient air flows through the front grill to a fuel-cell intake. Inside the cell, the airborne oxygen combines with hydrogen from the storage tank to form water. The reaction releases electrochemical energy, which is then converted into the electricity that powers the motor. The water escapes through the tailpipe as a vapor or a trickle. Fuel is only the most obvious difference between the hydrogen-powered Tucson and the conventional version. Price is another. The standard Tucson carries a manufacturer’s suggested retail price of $19,395. With the amenities and options of the fuel-cell prototype ― the bright white exterior finish, plush black leather seats and array of features ― a gasoline version would run you about $26,400. What keeps this model from competing, at the moment, is the price, which might hit an estimated $200,000 if the cars were sold to consumers today. Manufacturers working on fuel cell vehicles generally hope to shrink the price to about $50,000 by 2015. And then there’s the engine. The regular Tucson is powered by a 2-liter inline 4-cylinder engine that delivers 165 horsepower and 29 mpg on the highway. The GLS and Limited editions offer a 2.4-liter that pushes the horsepower to 176 and gets 30 mpg. That means the standard Tucson is no sports car. Nor is the GLS for that matter. By comparison, a new Volkswagen Passat sedan delivers a little more than 200 horsepower. The hydrogen-fueled Tucson is rated at 134 horsepower and hits 60 miles per hour from a standstill in just past 12 seconds. In a road race, the gas model is going to pony up faster. The dashboard is familiar but not identical to ones we’re used to. Instead of a tachometer that shows revolutions per minute (rpm), the driver sees a power meter, a similar visual measure of how hard the engine is working. The car is rated in kilowatts, with a maximum output of 100. The driver can track the surge in power through the six gears, as with a tach, with the needle settling down at about 20 KW at 100 kilometers per hour on the highway. The motor kicks down into sixth gear for a nice, hushed cruise. In a gasoline vehicle, that’d be about 2500 rpm. The vehicle’s overall smoothness is noteworthy, particularly in comparison with popular alternative-fuel vehicles. Hybrids, such as the Toyota Prius, shift noticeably from the gasoline engine to the electric motor. At times they sound like they’ve been turned off entirely, only to ramp up again when the stoplight turns green. By contrast, the fuel-cell-powered Tucson delivers a smooth acceleration, without any lag, from a standing stop. It picks up readily in city traffic and joins the highway eagerly. We ran it from downtown Washington, dodging a death-defying bicyclist two blocks from the White House and a distracted taxi driver further up the road. We drove out across the 14th Street Bridge and passed the Pentagon at a speed that the Virginia state police might not appreciate. If this were Montana, we were confident, we’d have plenty of reserve ponies. This car competes well with aggressive traffic in the city and on the open road. The other driving attributes ― the tight little turning circle and all the rest ― are the functions of the lithe vehicle in which the motor and fuel cell are mounted. This prototype Tucson weighs about 200 pounds more than a gas model, a negligible difference, roughly equivalent to a father-in-law in the backseat. The compressed hydrogen tank is hidden under the back seat and trunk. The fuel cell and battery are tucked under the middle of the car. The engine and motor maximize space under the hood. Getting all this down to size for packaging in a smaller sedan is the next challenge for the developers; Hyundai rolled out its first concept car at the 2011 Seoul motor show. The main trouble with a hydrogen-powered car might not have anything to do with the car. 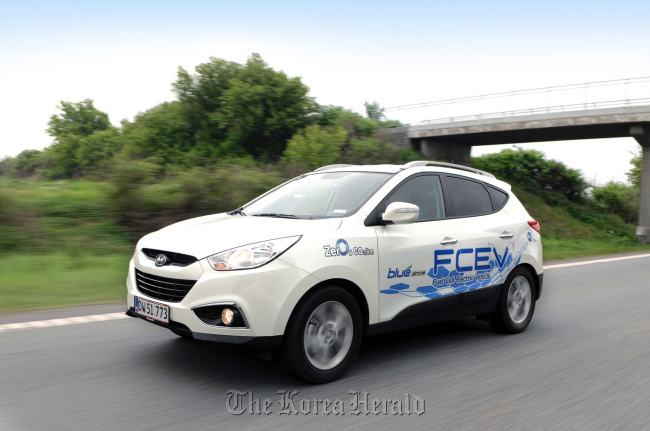 Unlike other alternative-fuel vehicles, fuel-cell cars can’t be refueled just anywhere. Gas stations can’t flip a switch and store compressed hydrogen instead of liquid gasoline. That’s why Hyundai is currently eyeing fleets operated by companies and government agencies for potential sales and leasing. The vehicles can just refuel in the company or agency motor pool. Drivers shouldn’t leave fueling up to the last minute, though. The fuel cell and battery aren’t as forgiving as the internal-combustion engine. As we counted down the driving miles left in the hydrogen tank, with its home fuel station 3,000 miles away in California, we concluded that this one still has a long way to go before drivers at large see it ― and that if they drive it, they’ll like it.